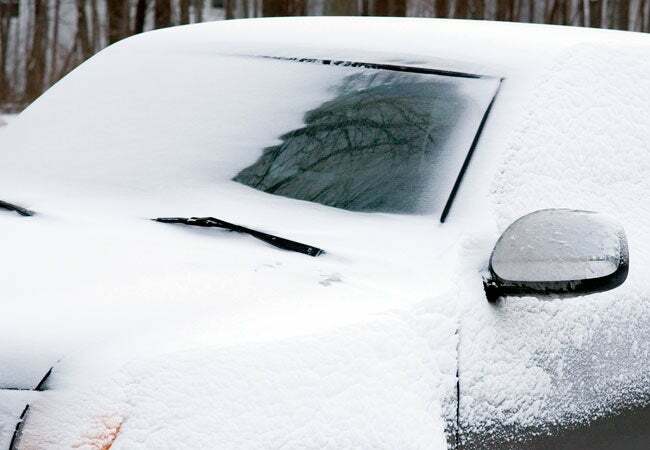 Get your windshield crystal clear and primed for your next wintertime drive with these proven defrosting techniques. If you’ve ever parked your car outside during an onslaught of sleet or a frigid winter’s night, you’re familiar with the frustration of waking up to a windshield riddled with frost or under a thin sheet of ice. Your solution might be to let the engine run with the defroster on and wait for the problem to melt away—a prospect that wastes precious time and gas. Or you might opt to manually scrape the windshield, an effort-intensive chore outside in the cold. Fortunately, there are a few better, faster ways to attack the problem and get you safely back on the road. Below, we outline three foolproof techniques for how to defrost a windshield—as well as how to prevent further freezing episodes. Fill a gallon-size bucket three-quarters of the way with lukewarm water. 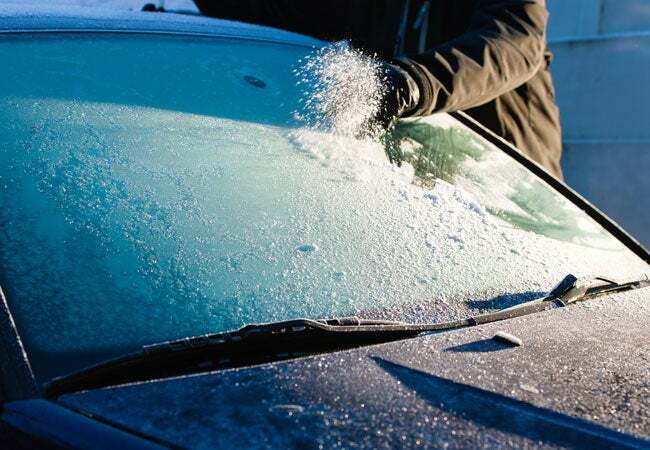 (Never use hot water; the temperature difference between it and the frozen windshield will cause the glass to expand, and in some cases, crack.) Tote the bucket to your car and gradually pour the water over the frozen windshield, starting from the top left or right corner and working horizontally across the glass. As the warm water trickles down, it will immediately thaw the ice in its path, turning it into an opaque slush. Remove this by either running your windshield wipers or wiping down the windshield with a gloved hand. 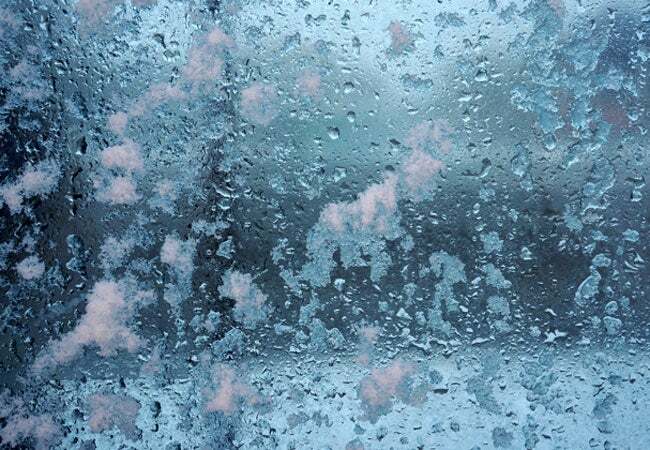 Use any remaining warm water to thaw iced-over car windows—just be sure the windows are fully closed first! That alcohol you rely on to clean minor scrapes makes an effective deicer because it has a much lower freezing point than water (minus 128 degrees Fahrenheit). When applied to an icy windshield, the alcohol itself doesn’t freeze; instead, its heat is transferred to the ice, increasing its temperature and melting it. To de-ice, fill a dry, 12-ounce spray bottle with four ounces of room-temperature water and eight ounces of rubbing alcohol, then replace the spray head and invert the bottle a few times to mix. Spray over your windshield to completely coat the glass, then let the solution dwell for one minute, allowing the alcohol to seep into and soften the ice. Wipe frost away with a gloved hand, or scrape with a plastic credit card. 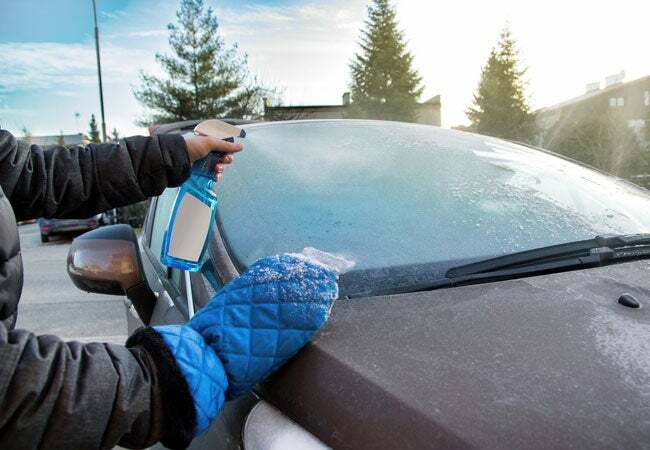 When your windshield is clean and clear, store the spray bottle in the glove box or trunk so you can tackle future freeze-ups away from home. Rubbing alcohol’s ultra-low freezing point means there’s virtually no risk of your deicer freezing on you. Prefer to de-ice your windshield from the warm and toasty confines of your car? Fill two old socks or mittens with uncooked rice, then zap the rice-filled socks in the microwave for 30 seconds. While sitting in your car, grab one sock in each hand and gently glide them over the entire interior surface of the windshield glass, taking care not to position the heated sock over any one spot for more than 10 seconds (this can increase the risk of the glass cracking). The heat from the rice will transfer to the glass and start to melt the windshield ice. When the frost has melted or sufficiently softened, run your windshield wipers to clear off the slush. • Whenever possible during the cold season, park in a garage with all of your car windows closed. • If you don’t have indoor parking, cover your car with a tarp or place a beach towel or a few rubber mats over the windshield, using your wipers as clips to secure the cover in place. The will act as a shield, accumulating frost and ice while the glass below remains clean and clear. • Place an old stocking or knee-high sock over each of your windshield wiper blades to keep dew and snow from reaching them; this will keep the blades from freezing in place on the glass.